Roy Jay Glauber (September 1, 1925 – December 26, 2018) was an American theoretical physicist. He was the Mallinckrodt Professor of Physics at Harvard University and Adjunct Professor of Optical Sciences at the University of Arizona. Born in New York City, he was awarded one half of the 2005 Nobel Prize in Physics "for his contribution to the quantum theory of optical coherence", with the other half shared by John L. Hall and Theodor W. Hänsch. In this work, published in 1963, he created a model for photodetection and explained the fundamental characteristics of different types of light, such as laser light (see coherent state) and light from light bulbs (see blackbody). His theories are widely used in the field of quantum optics. In statistical physics he pioneered the study of the dynamics of first-order phase transitions, since he first defined and investigated the stochastic dynamics of a Ising model in a largely influential paper published in 1963. He served on the National Advisory Board of the Center for Arms Control and Non-Proliferation, the research arms of Council for a Livable World. Glauber was born in 1925 in New York City, the son of Felicia (Fox) and Emanuel B. Glauber. He was a member of the 1941 graduating class of the Bronx High School of Science, and went on to do his undergraduate work at Harvard University. After his sophomore year he was recruited to work on the Manhattan Project, where (at the age of 18) he was one of the youngest scientists at Los Alamos National Laboratory. His work involved calculating the critical mass for the atom bomb. After two years at Los Alamos, he returned to Harvard, receiving his bachelor's degree in 1946 and his PhD in 1949. Glauber's recent research dealt with problems in a number of areas of quantum optics, a field which, broadly speaking, studies the quantum electrodynamical interactions of light and matter. He also continued work on several topics in high-energy collision theory, including the analysis of hadron collisions, and the statistical correlation of particles produced in high-energy reactions. Specific topics of his research included: the quantum mechanical behavior of trapped wave packets; interactions of light with trapped ions; atom counting-the statistical properties of free atom beams and their measurement; algebraic methods for dealing with fermion statistics; coherence and correlations of bosonic atoms near the Bose–Einstein condensation; the theory of continuously monitored photon counting-and its reaction on quantum sources; the fundamental nature of "quantum jumps"; resonant transport of particles produced multiply in high-energy collisions; the multiple diffraction model of proton-proton and proton-antiproton scattering. Glauber received many honors for his research, including the Albert A. Michelson Medal from the Franklin Institute in Philadelphia (1985), the Max Born Award from the Optical Society of America (1985), the Dannie Heineman Prize for Mathematical Physics from the American Physical Society (1996), and the 2005 Nobel Prize in Physics. Professor Glauber was awarded the 'Medalla de Oro del CSIC' ('CSIC's Gold Medal') in a ceremony held in Madrid, Spain. He was elected a Foreign Member of the Royal Society (ForMemRS) in 1997. For many years before winning his Nobel Prize, Glauber was familiar to audiences of the Ig Nobel Prize ceremonies, where he took a bow each year as "Keeper of the Broom," sweeping the stage clean of the paper airplanes that have traditionally been thrown during the event. He missed the 2005 event, though, as he was being awarded his real Nobel Prize for Physics. Glauber lived in Arlington, Massachusetts. Glauber had a son and a daughter, and five grandchildren. He died on December 26, 2018 in Newton, Massachusetts. ^ Knight, Peter; Milburn, Gerard J. (2015). "Daniel Frank Walls FRSNZ. 13 September 1942 — 12 May 1999". Biographical Memoirs of Fellows of the Royal Society. Royal Society publishing. 61. doi:10.1098/rsbm.2014.0019. ISSN 0080-4606. ^ Glauber, Roy (2009). 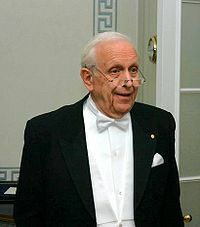 "An interview with Nobel laureate Roy Glauber, Physics 2005". Journal of Visualized Experiments (28). doi:10.3791/1535. ISSN 1940-087X. PMC 3149897. ^ "Scientists Question Nobel - News - The Harvard Crimson". www.thecrimson.com. ^ Glauber, R.J. (1963). "Time‐dependent statistics of the Ising model". Journal of Mathematical Physics. 4. doi:10.1063/1.1703954. ^ "Board". Center for Arms Control and Non-Proliferation. Center for Arms Control and Non-Proliferatio. Retrieved 22 September 2016. ^ Debus, Allen G. (6 January 1968). "World Who's who in Science: A Biographical Dictionary of Notable Scientists from Antiquity to the Present". Marquis-Who's Who – via Google Books. ^ Glauber, Roy Jay (1949). The relativistic theory of meson fields (PhD thesis). Harvard University. Bibcode:1949PhDT.........7G. OCLC 76985581. ^ "In Memoriam: Roy J. Glauber, 1925-2018". Retrieved 28 December 2018. This page was last edited on 9 January 2019, at 05:53 (UTC).